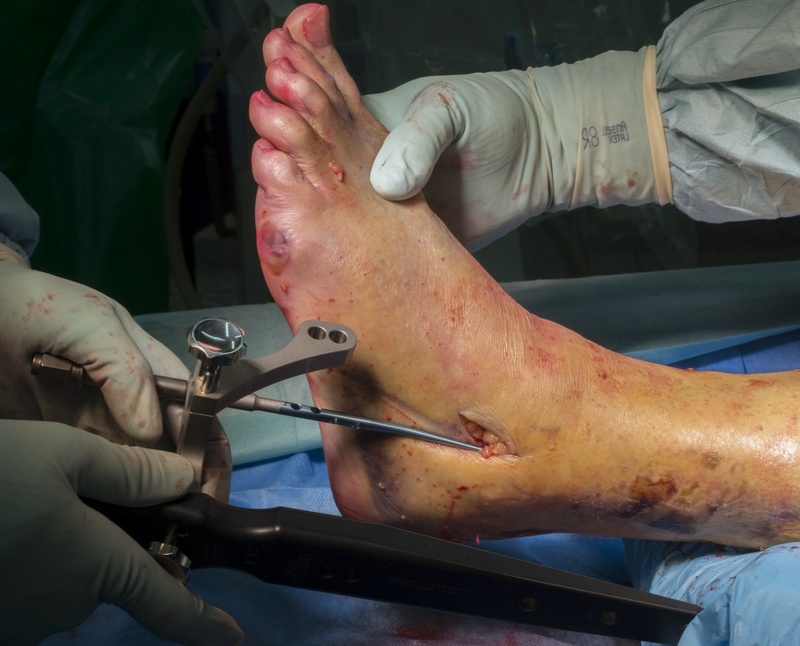 Learn the Lateral malleolar fixation using Acumed Fibula Rod System surgical technique with step by step instructions on OrthOracle. Our e-learning platform contains high resolution images and a certified CME of the Lateral malleolar fixation using Acumed Fibula Rod System surgical procedure. Most ankle fractures are stable meaning that, under physiological load, the key stabilising structures of the ankle joint remain sufficiently able to perform their function. Therefore, stable ankle fractures are, by and large, managed non-operatively. In the remainder, stability can be conferred to various structures by a variety of methods. Factors that govern the choice of fixation range from available resources and surgical preference to factors determined by the pathology facing the surgeon. These factors are often influenced not only by the quality of the bone such as the degree of comminution or osteoporosis, but also by the effects of the injury to the soft tissue envelope. The Acumed Fibula Rod System (FRS) offers the surgeon an additional, proven treatment option with advantages over open techniques for those with poor quality bone and soft tissue envelope. When a bone breaks, the skin is subjected to large strains and the dermo-epidermal junction shears giving rise to fracture blister formation. This occurs most frequently in anatomic sites where a bone lies subcutaneously and is more pre-disposed in any co-morbidity that impedes wound healing. Blisters can be clear or haemorrhagic with the latter indicating more severe injury to the dermis. The definitive management of fracture blisters with regards timing of surgery and whether to aspirate, incise through or leave well alone is not clear from the literature. In an era of an ageing population, surgeons face difficult decisions about how to confer stability to the skeleton with appropriate rigid internal fixation. This case illustrates the various dilemmas facing surgeons in making and performing surgical treatment plans in an elderly patient with a poor soft tissue envelope. The case features the decision-making steps in using the Acumed Fibula Rod System (FRS) as the definitive treatment option for a fracture of the lateral malleolus in a patient with poor quality bone and significant compromise to the soft tissue envelope.